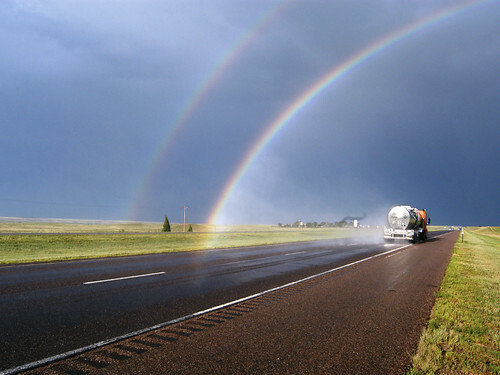 I remember seeing this double rainbow over I-80 when my dad and I were driving back to college before my senior year. While I was organizing some old digital photos I found this shot and I was surprised by how vibrant the color was. The pavement is as black as I remember it, the sky as deep blue. I made a global levels adjustment in Photoshop, but I didn’t do anything special to highlight the rainbows. Thought you might enjoy the shot. If you want to see the original, I put together a side-by-side comparison. It might look like I pumped up the blues, but the original has a yellow color cast. Smashing pic, that metallic tanker really sets off the sky. Anything like that from Chile?